Description: Ianassa is a Bernumaid student at Aquapiper Academy; an underwater school for witches. She is a very overeager student who, when excited for something, likes to get it done as soon as possible. And if that something involves other people, she likes to bring them along for the ride, no questions asked. Though she’s quick to act, she is not arrogant, she is simply a very overactive individual, and she does care for her friends’ well-beings. It’s just, sometimes she can be the cause of whatever trouble occurs to their well-beings. But still, many people like her and she has many friends, because they find her overeagerness and cheerfulness endearing, and a positive influence on pushing forward through their objectives. And Ianassa likes to push them forward and motivate them until the end. Although, while Ianassa is overeager, she can be a bit lackadaisical in her lessons. Sometimes she misses classes entirely by sleeping through them, or by playing hookie to fulfil her own objectives. However, she does possess talent, mastering a large quantity of spells with near-veteran quality. It’s just her teachers are a bit disappointed she likes to waste that talent on just doing what she wants. Ianassa is also a bit forgetful of her own schoolwork; leaving tomes and textbooks behind, as well as forgetting where her classroom is; although the latter is common among all students of Aquapiper Academy as the school is magically designed to be like an ever-shifting maze to test each student’s wit and resourcefulness. Ianassa’s boyfriend is Alex Jacobs, a fisherman whom she met on one of her rounds of hookie. Both figuratively, and literally. You’ll see why later into Chapter 6. She has such a high opinion of him, and envisions him as a burly Fabio in contrast to his scrawny appearance. Why she developed these intense feelings of admiration for him is anyone’s guess, but it could be the romantic dawn they shared together on that round of hookie that stole her heart. She will do anything to protect him and his friends, even it means going against a professional mage like Barician one-on-one to distract him whilst Artie rescues her classmates from being taken away from the Skorned. Even if it means she will lose, she’s giving it her all. And with that confident smirk on her face, too. 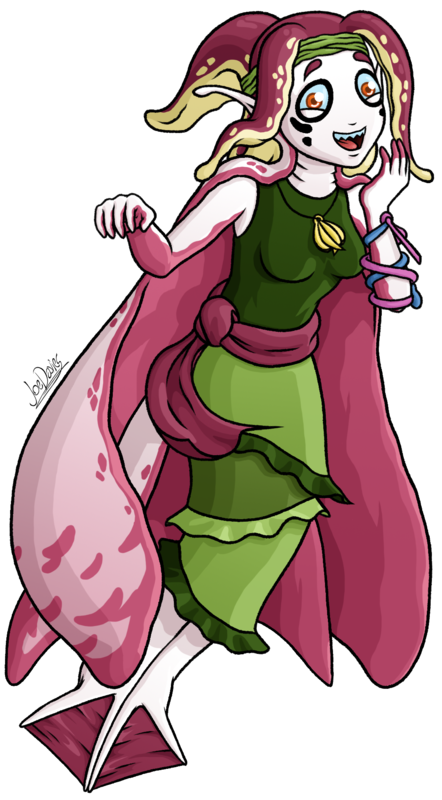 – Ianassa was designed by my good friend Ester Kawai (also known as “gerugeon” on DeviantArt), as the winner of a contest I held to design a Bernumaid character for Chapters 5 & 6. I didn’t have any involvement with her design whatsoever, besides the bracelet on her left arm, and a rewriting of her personality for the sake of my comic.